Description of diagnostic adapter. Appearance. Warning and control buttons. 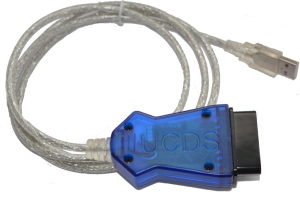 Diagnostic adapter from the hardware-software Universal Can Diagnostic system (UCDS) is manufactured on a standard printed circuit board with the use of modern high-speed electronic components. It`s manufactured in Russia, Saint-Petersburg. PCB with the necessary controls and indicator lights is built into the standard plastic mini-box (photos 1-5) with USB-connector for connection to a PC with pre-installed drivers and software and OBD II connector for connection to the car diagnostic interface. Inspection lights allow you to visually determine the current state of the power supply, a process that takes place in real time (read/write data), depending on the mode of operation of the adapter. External controls on the adapter are made in the form of push-buttons that serve solely for the adapter mode without connecting to a PC. The adapter has built-in capability to update its internal software (firmware). For the latest version, please contact the developers. 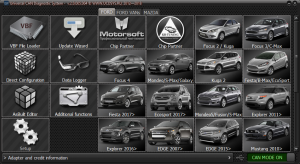 UCDS currently works with the following platforms: Focus II 2004-2011; Focus III 2011, 2015 ;FOCUS MK4; Kuga I, Kuga II; C-MAX; S-MAX; MONDEO IV; Mondeo 2015 ; Galaxy ; Tansit; Fiesta 2008, 20015 etc..